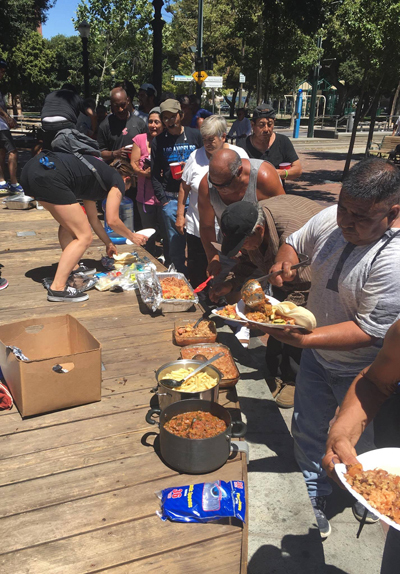 San Jose Food Not Bombs to continue sharing free meals with the hungry at St. James Park regardless of the city’s plan to ban the decades old practice. Please consider helping us share food without a permit — an infraction or maybe even a misdemeanor — at St James Park in San Jose at 2:00 PM on August 6, the 72nd anniversary of America’s nuclear bombing of Hiroshima. Councilman Peralez is advancing the failed theory that “street feeding” enables the homeless to stay homeless and that they would have access to recovery programs and jobs if they where unable to get meals on the streets and were forced to eat indoors at “established” programs. So, that’s in part where the impetus for the new policy came from. On July 28th I called the Department of Parks, Recreation and Neighborhood Services director’s office to find out if churches feeding the hungry at St. James Park would be cited with an infraction or a misdemeanor. I asked if she knew where the idea of providing wrap-around services originated. She had no idea and she directed me to Ray Bramson, Director of Housing. I could not reach his office. Those wrap-around services seem to include Food Not Bombs, since I receive at least one or two calls every few months from hungry people referred to San Jose Food Not Bombs by San Jose Social Services. During the past six months police told Food Not Bombs to stop sharing meals in Buffalo, New York, Eureka, California, and sent health department officials to interfere with Food Not Bombs in Champaign Urbana, Illinois. The struggle for the right of Food Not Bombs to share meals outside in Houston, Texas is also heating up, and anti-homeless advocates in Santa Cruz, California continue their attempts to close the twice weekly Food Not Bombs meal. Robert Marbut, a consultant hired by cities to address homelessness, is likely the most prominent advocate of this theory, and has been hired as a highly paid consultant by several cities. Daytona Beach renewed Marbut’s contract in January 2015 at a cost of $7,201.25 per month for 14 months, plus up to $35,000 for expenses. The new payment will bring Marbut’s total compensation from the city since last year to roughly $185,000. NPR’s Rachel Martin interviewed Marbut in 2014 after the City of Ft. Lauderdale, Florida generated headlines about the arrest of 90-year-old Arnold Abbott and Food Not Bombs volunteers for sharing food outside the downtown library. Said Marbut, “If you give food on the street, you end up in a very convoluted way, but still an important way, you end up preventing people from going into 24/7 programming.”? Marbut’s model program is the 37-acre Haven for Hope campus that opened in the summer of 2010 in his home town of San Antonio, Texas. Local media welcomed the opening: “Comprehensive services like those provided at Haven For Hope are typically only available in state prisons.” The campus has 550 closed-circuit television cameras and a staff of 40 security-guards. San Antonio is not the only city to witness the failure of programs based on Marbut’s theory.. Fort Smith, Arkansas, Placer County and Fresno, California, Daytona Beach, Ft. Lauderdale, Key West, Sarasota, St. Petersburg and Pensacola, Florida are among the cities that tried Marbut’s program only to find hundreds of people still forced to live in the streets. Over 13% of the American population currently receive SNAP food stamp benefits, including low income families with children, the elderly, people with disabilities, and those who have recently become unemployed. They receive an average of about $4.17 per day or $1.39 per meal. Nearly half of SNAP recipients are children. That’s 20 million kids or 1 in 4 Americans under the age of 18. The US Congress just passed a huge increase in military spending exceeding Trump’s proposed “defense” budget request by $18.5 billion. The National Defense Authorization Act (NDAA) would spend $696 billion on the military in fiscal year 2018, beyond President Trump’s requested budget — a budget the White House boosted as a “historic increase in defense spending”. The NDAA received bipartisan support, with 117 House Democrats and all but eight Republicans voting in favor.